Inflatable water slides provide many hours of fun.” Climb an 18 foot slide and fast drop to the cushioned bottom and get ready to do it again for a second turn. 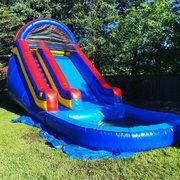 Water slide rentals are unique outdoor units with many hours of fun. Celebrants run, climb, and slide. 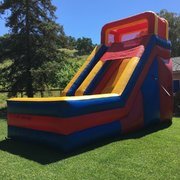 Celebrants will climb the 18 foot slide and fast drop to the cushioned bottom. Guaranteed to appease thrill seekers. It’s like having a water park right at your home. We also have a Dry slide available for spaces were water use is not appropriate. Browse the selections below and click on the title or image for more information and to make a reservation.